The origin of this article is (again) due to a forum question: “I want to rotate a triangle around a certain point” using the Rotation effect. It is time to explain the importance of the reference or registration point for objects in Captivate. 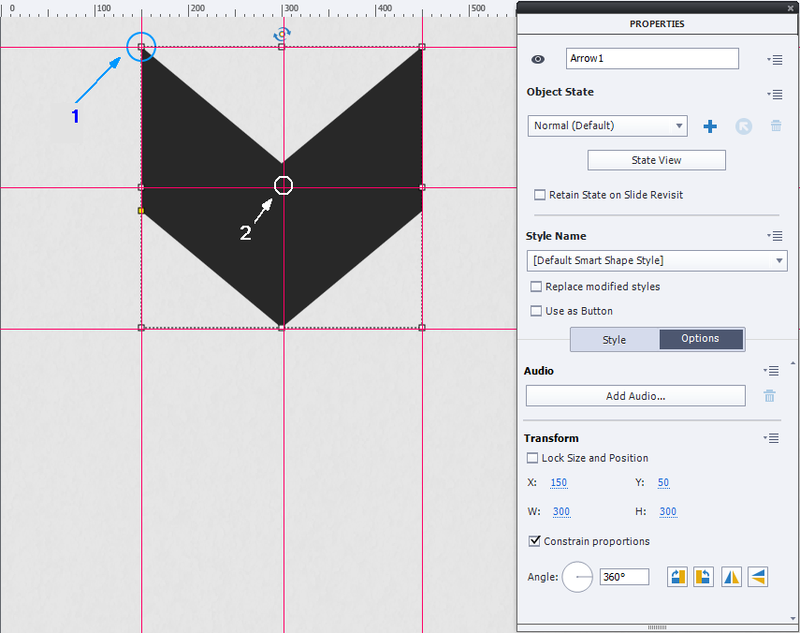 In other Adobe applications like Illustrator, InDesign, Animate you have lot of control over that point. Look at this small screenshot: it shows that reference point in two different locations. 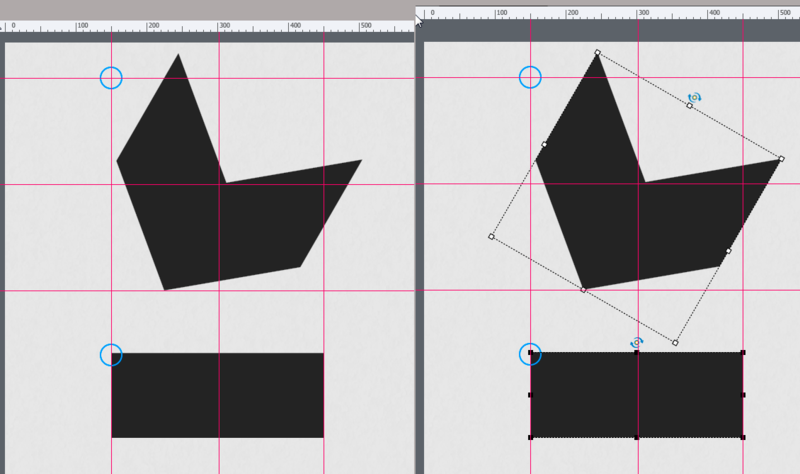 Sorry for the low resolution, it is very small in Illustrator: left image shows the reference point in the left center, the right image at the bottom right. It was that last point that was wanted by the OP in the forum, but … Captivate doesn’t allow changing the reference point. The Reference/registration point in Captivate is used in different situations. In some situations it is located at the top left corner of the bounding box, in other situations in the center of the bounding box. 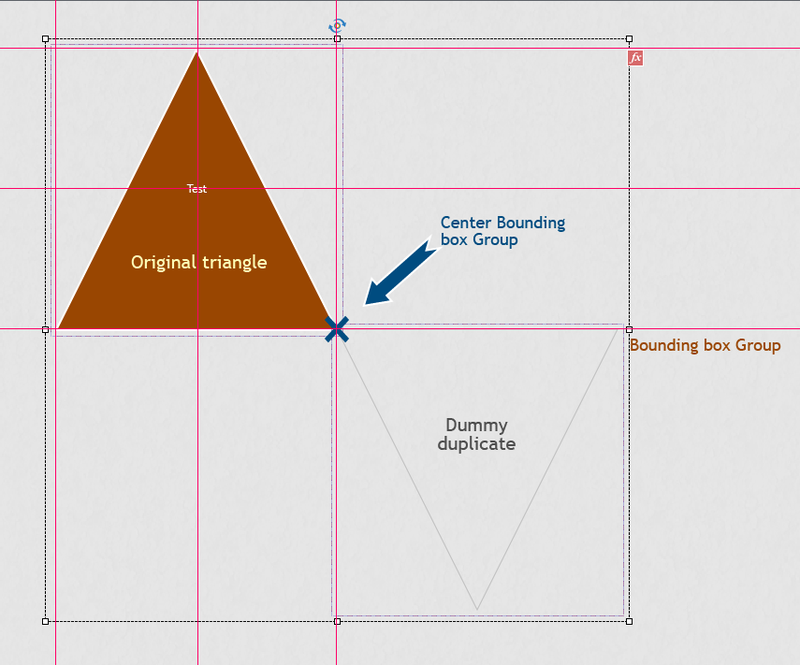 The ‘bounding box’ is the rectangle surrounding the object or the object group. You’ll see it during editing, when selecting an object or a group. The visual presentation of that box on the stage is not looking always exact, it can look larger than it really is. The correct size (px) of that box can only be seen in the Options tab of the Properties panel. Location, resizing, rotating “1” or “2”? The red lines in this screenshot are guides. The dotted square is the bounding box. The blue circle indicates the first reference point, which is top left and has its coordinates in X and Y in the Options tab. 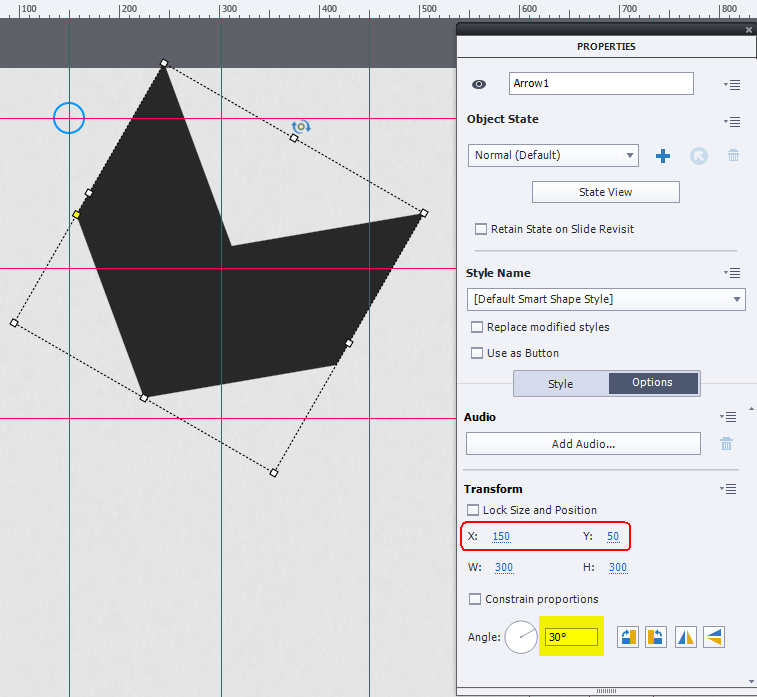 If you uncheck the ‘Constrain Proportions’ option, and increase the Width (W) or the Height (H) you’ll see that the reference point will not move, increasing width will move the right border of the bounding box, increasing height will move the bottom border. If you align two or more objects (use the Align Toolbar which you can open by Window menu) the result can be surprising. Have a look at this first screenshot: I kept the rotated arrow, added a rectangle with exactly the same width (300px), and having the reference point at the same X value. That means that the center point of both shapes has the same X value as well, centering the shape will not move them. In a first test, I selected the arrow first for alignment (see right image in screenshot). The result for left align is to be seen in the left image: the most left point of the bounding box of the arrow has been used as reference. 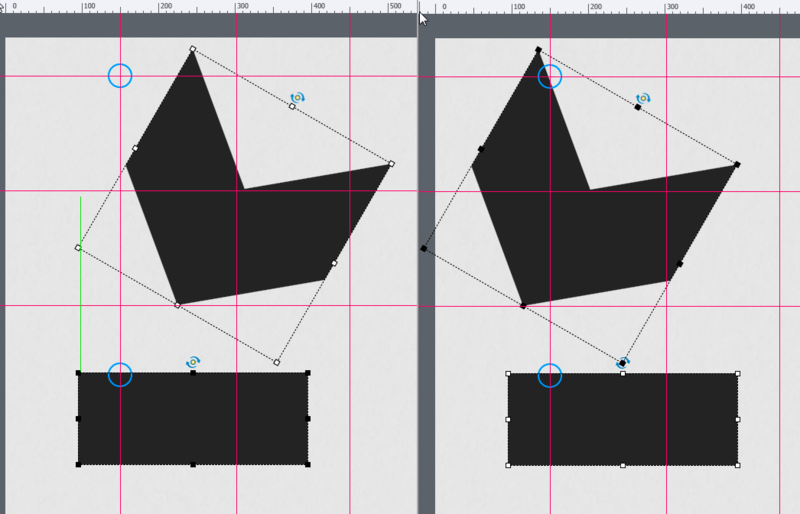 When the bounding box is turned off, there seems to be no ‘alignment’ between the shapes. The second image looks better. Same alignment rules when you use grouped objects instead of single objects. The bounding box of the group is what matters. For all effects the center point of the bounding box (white circle in the very first screenshot) is the absolute reference point. It is the case for all categories of Effects. Especially for motion effects, the new Guides are very handy to locate the start, end and intermediate points of the motion path as I showed in this post: Guides Rule!. Add an object that is ‘invisible’ to the end user, like a shape with a Fill Alpha = 0 and a stroke = 0. Group that object with the object to be rotated, in such a way that the center of the group bounding box coincides with the rotation point you want to use. The red lines are guides which will not be visible on publishing. You see in this screenshot that the bounding box looks bigger than it really is, because its exact size is indicated by the red guides. If you followed my blog, you know that I love cheating on Captivate. But in this case I would be more than happy if we could control the reference point for a lot of use cases. Imagine having to rotate that triangle again around another rotation point? Or having to rotate a hexagon around one of its points? It is fun to use workarounds, but it takes …..time. Please help supporting this request by entering it, which can be done right from this portable, look to the right, under Contribute! In that case, please log a feature request! Only when many users ask for a feature, it could maybe included in a future release. Thanks Wayne for submitting the request. We will look into this. No problem Shambu, keep up the good work!!! I agree Lieve rotation points would be a very useful and time saving feature especially since they are so widely used in the Adobe Suite of products. I can see them being very useful especially with object states and interactions.